Some say human rights are an ideology imposed on the rest by the powerful west. Consequently, critics say, human rights ideas don’t resonate as broadly as they should. Our Human Rights Perception Polls, however, show that differences within countries, rather than between world regions, pose an equal, or perhaps even greater, challenge. Human rights, we find, are more “toproots” than grassroots, although there are signs of progress. We studied Mexico, Colombia, Morocco, and India, choosing these countries for their multiple religions and world regions, and because they were best-case scenarios for human rights diffusion. Pilot testing the survey in Morocco, September 2012/ Dr. David Crow. All rights reserved. The data, however, show that among our survey populations, human rights language, people and activities are better established among elites than among society’s lower echelons. Unfortunately, this means that those who stand to benefit most from human rights norms—the poor, the powerless, and the oppressed—have less access to the human rights tools they need. To break through this glass floor, domestic human rights workers will have to redouble their efforts and find new ways of becoming locally relevant. To gather this unique information, we polled publics in four countries (in Mexico and Colombia as part of the Mexico, the Americas, and the World survey project, coordinated by top Mexican research institute, CIDE), and will soon extend the research to Brazil. Surveys of this sort are rare. Pollsters regularly survey populations on everything from their political views to their toothpaste preferences, and have even begun asking about peoples’ post-war transitional justice preferences. However, they have yet to ask ordinary people about their experience with their own country’s human rights movements. In Mexico, we surveyed the entire public as well as the country’s “power elite”: business executives, elected officials, high-ranking bureaucrats, journalists and academics. Mexico is a best-case scenario for human rights diffusion because its population is wealthier, better educated, and more exposed to global ideas than many. It is also in Latin America, ground zero for the global human rights movement, and is wracked by a brutal drug war causing extensive human rights damage. Our Colombian research also sampled the country’s adult population, many of which are no stranger to human rights talk as a result of their Latin American identity, and their country’s decades-old experience of violence. The Moroccan study sampled the entire adult population of Rabat and Casablanca, the country’s political and financial capitals, as well as rural residents living up to 70 kilometers from either city. Morocco’s people are poorer and less educated than Mexico’s or Colombia’s, but its human rights activists are impressively energetic. The Arab Spring, moreover, has boosted local interest in human rights issues, making Morocco another best-case scenario for diffusion. In India, we sampled residents of Mumbai, the country’s business capital, as well as people living in the rural areas of Maharashtra state. India’s population is less educated than either Latin American case, but the country is vigorously democratic, with a deeply committed human rights sector grounded in many decades of rights-based protest. As Figure 1 demonstrates, Mexican elites are far more likely than the general public to encounter the term “human rights,” (derechos humanos in Spanish) in their daily lives. A whopping 90% of Mexican elites reported hearing the term daily or frequently, compared to only close to 40% of the general public. Figure 1. View larger version of this figure. Yet even 40% is a big number. With Mexico’s estimated adult population of 71.7 million, some 28.7 million Mexicans regularly encounter the term derechos humanos in their daily lives. Not bad! The words, human rights, are drenching Mexico’s top-roots, but the grassroots are still getting some moisture. Next, consider Colombia. As Figure 2 notes, 49% of Colombian adults also routinely hear derechos humanos, suggesting that both countries are part of a broader Latin American pattern, due to the region’s long history of human rights activism. Our Moroccan survey revealed even higher numbers. In and around Rabat and Casablanca, the country’s top two cities, 54% of adults reported hearing the French, droits de l’homme, or the Arabic, hukuk al insaan (حقوق الإنسان). A clear victory for the country’s human rights sector, which fought hard to place its concerns on the public agenda. Figure 2. View larger version of this figure. Our Indian survey found much less exposure, however. Only 20% of the population in and around Mumbai, the country’s financial center, reported hearing the Hindi term, mānava adhikāra ( मानव अधिकार ), or the Marathi term, mānavī adhikāra (मानवी अधिकार ), on a regular basis. Simple exposure to “human rights” is only one indicator of popular engagement, however, and an arguably better measure is contact with members of local human rights organizations. Here, the divide between Mexican elites and the public is even greater. 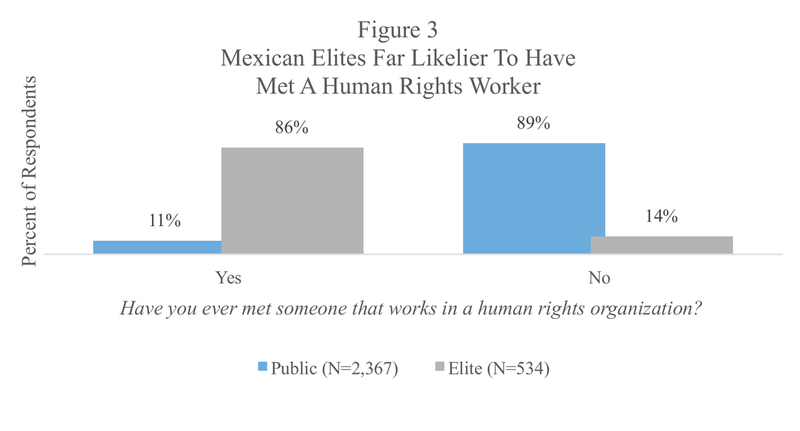 As Figure 3 notes, a stunning 86% of Mexican elites report having met someone working for a human rights organization, but almost 90% of the general public report the opposite. This disparity provides powerful evidence of Mexican human rights workers’ tendency to cluster in the upper realms of socioeconomic space. These advocates may be dissident renegades from their social class—a human rights “vanguard”—but they still populate social spheres inhabited by the powerful. Figure 3. View larger version of this figure. Yet here, too, the glass is half full, since 11% of Mexico’s general population has met a human rights worker at least once in their life. In absolute terms, this is no small figure, translating into some eight million ordinary Mexicans. In one sense, that’s a remarkable achievement. On this count, Colombia’s track record is far better than Mexico’s, since 18% of that country’s adult population report contact (see Figure 4). At 7%, Rabat and Casablanca again came third, while Mumbai was the real laggard, with only 1% of polled residents having met a human rights worker. All human rights sectors have their work cut out for them, but Mumbai’s, Rabat’s, and Casablanca’s needs are particularly acute. Figure 4. View larger version of this figure. Participation in human rights activities is another key indicator of popular engagement, and once again, our data provide evidence of human rights clustering at the upper levels. 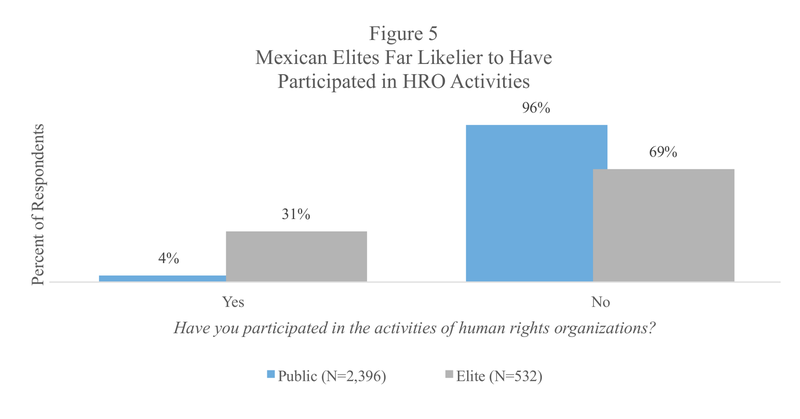 In Mexico, as shown in Figure 5, over 31% of elites report participating in some kind of organized human rights activity, but the same is true for only 4% of Mexico’s general public. As Figure 6 demonstrates, Colombia and Mumbai’s record resembles Mexico’s, while Rabat and Casablanca’s lags. The reasons for these discrepancies are not immediately clear. Figure 5. View larger version of this figure. Importantly, exposure to, contact with, and participation in the human rights movement are not tightly correlated. Each of these areas of human rights work has its own challenges and opportunities, and national human rights communities that perform well on one measure do not necessarily do well on others. Figure 6. View larger version of this figure. We couldn’t reproduce our Mexican elite sample elsewhere, as it drew on a decade of prior research. Statistical analysis, however, suggests that in all four countries, human rights organizations are better at recruiting elites than at mobilizing the popular classes. 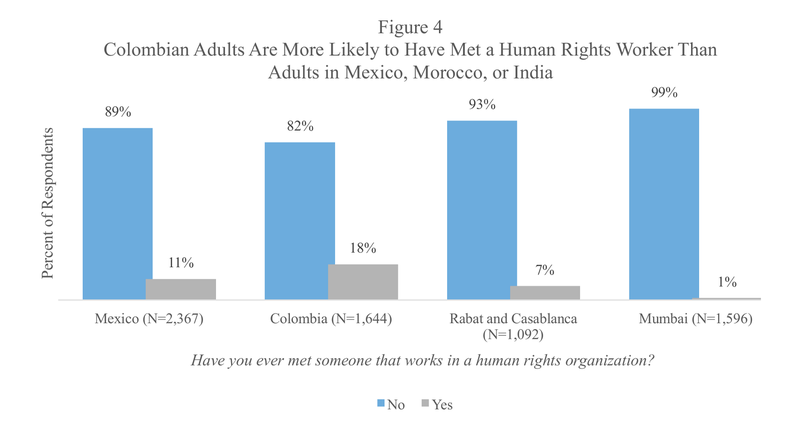 In all samples, for example, people with more education hear the words “human rights” more frequently, and in Mexico, Colombia, and Morocco’s Rabat and Casablanca, the better educated are also more likely to have had contact with human rights workers. In Mumbai and the rural areas of Maharashtra state, the better educated are also more likely to participate in human rights activities. Similarly, the wealthier (measured both by income and by the number of light bulbs and rooms in a house) are likelier to hear about human rights in Colombia, Mumbai, and in Rabat/Casablanca; know a human rights worker in Colombia and Rabat/Casablanca; and participate in human rights activities in Rabat/Casablanca. Those with greater exposure to diverse social influences are similarly more exposed to human rights. Urban dwellers are far likelier to hear about human rights in Mexico and Mumbai, and Colombian and Mumbai Internet users are more exposed to human rights, and have more contact with human rights workers. In Rabat and Casablanca, they are likelier to participate in human rights activities. The politically active—voters—also have higher rates of exposure to human rights in Colombia, Mumbai, and our Rabat/Casablanca sample, and higher rates of contact in Colombia. Voting in all countries is also concentrated among the economically and educationally better off. Conversely, marginalized groups, including linguistic and religious minorities, are less likely to be in the human rights loop. Indigenous groups in Colombia and Mexico (as well as other ethnic minorities in Mexico), and Muslims in Mumbai, hear about human rights less frequently. Mexican indigenous groups, moreover, are less likely to participate in human rights organizations. To be sure, there are some exceptions; in some cases, marginalized groups are gaining more access to human rights. In Mumbai, for example, Buddhists, a religious minority, hear the phrase “human rights” more frequently than the Hindu majority, perhaps due to the mass conversion of dalits (Untouchables) to Buddhism. The Moroccan Amazigh (Berbers) have greater exposure to human rights in Rabat/Casablanca than ethnic Arabs, perhaps due to the Amazigh pride movement. And the relationship between exposure and income in Mumbai and Colombia is “U-shaped.” The very wealthy have greater exposure to human rights than the middle class, but so do the very poorest. Our research also finds evidence that some elites reject human rights norms, even though they may be familiar with them. Colombia’s better educated, for example, along with voters and urban dwellers in Mexico, participate in human rights activities less than the less well educated, voting abstainers, and rural denizens, even thought they are more exposed to human rights terminology, and have more contact with human rights workers. Exposure and contact, in other words, do not necessarily imply acceptance. Our research offers support for the notion that human rights are—for now—an elite-focused activity. In theory, the poor, the marginalized, and the oppressed are the human rights movement’s main constituency. In practice, however, these are not the groups with whom domestic human rights workers are making the biggest inroads. Elite familiarity and contact with human rights, moreover, does not guarantee good deeds or intentions. Elites are often the source of human rights problems, and we have no strong evidence that human rights exposure is revolutionizing their public policy preferences. In fact, our evidence suggests elites may be paying human rights lip service while continuing their business as usual. Our findings should not be cause for despair, however. First, there are promising signs of more broad based diffusion; in some places, on some indicators, domestic human rights groups are doing a better job of making contact and spreading their ideas. More importantly, our surveys offer only a single snapshot in time. Human rights mobilization, by contrast, is a long-term process. Over time, domestic human rights workers may exceed their upper strata limits, and make stronger inroads into their countries’ popular classes. To do this, however, human rights organizations will probably have to develop new and better mobilization strategies.